Realtors or homeowners who have ever tried to sell a house can tell you that the more visible an available home is, the quicker it will sell. In other words, the more hours a day that people are able to see that the house is for sale, the more likely you are to sell the home. Using solar real estate lights to accentuate signs and information pamphlets can be a great advertizing tool, doubling the exposure that a sign might normally get, since they allow it to be visible even after dark. A small investment in solar real estate lights can really help to get a property noticed and can really pay dividends in terms of getting a home off the market even quicker. There are also economical and ecological benefits associated with these lights. Because the energy of the sun costs nothing to use, solar energy products such as these will not add to your utility bills and can really save you money over time. Since the power of the sun is a clean and renewable source of energy, solar powered real estate lights are both economically and environmentally. They will not emit harmful CO2 and they will not deplete natural resources. The more that people are able to see that a home is on the market, the better. Lighting up signs and information pamphlets can really make a big difference in getting a home sold, since solar real estate sign lights helps to advertise a property even after dark. In this way, the small investment of these powerful little lights can really pay dividends as far as getting a home noticed and off the market even faster. Real estate solar lights are available to suit signs of just about any size and thickness. For signs which are less than 1 inch thick, there is the Solar Real Estate Light. The Real Estate Solar Light is compatible with signs which are three to four inches thick. For signs which are anywhere between 1 and 4 inches thick, the Sunpal 2x Solar Real Estate Light is a great choice. Another solar real estate sign lighting option is the versatile All-Purpose Light, which can illuminate not only signs but also walkways and decks. No matter the size or thickness of the signs you wish to illuminate, we offer a solar real estate lighting options to meet your needs. For example, the Solar Real Estate Light is ideal for signs which are less than one inch in thickness, and the Real Estate Solar Light works perfectly for signs which are three to four inches thick. The SunPal 2x Solar Real Estate Light can be utilized for signs between one and four inches thick. The Solar Real Estate Sign Light 4X is also built for post-hung real estate signs on posts that are 3-4 inches thick. The All-Purpose Light can not only illuminate real estate signs, but also works great for walkways and decks. For larger, commercial real estate property signs, our GENLight solar sign and flood light or TechLight commercial solar sign lights. Sign Lights are not the only solar real estate products which we offer. We offer a set of Security Screws which can help to prevent this. SunPal Security Kits are another great tool, which we offer in four different sizes to best accommodate your particular application. Leaving pamphlets at a property to inform potential home buyers of some key facts about the particular property can also be a great idea. 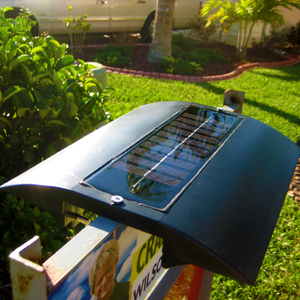 The SunBox solar brochure box light allows such pamphlets to be visible both day and night. Replacement Rechargeable Battery Packs, for all of your SunPal solar products are also available. Sign light options are not the only products we offer for real estate. Solar powered real estate lights from Solar Light World have a number of advantages over traditional Real Estate Lighting. The idea behind Real Estate Lighting is to make the fact that a property is available for sale is visible to as many potential home buyers as possible. This is a great way to help make sure that a property is sold as quickly as possible. Both solar powered real estate lights and traditional real estate lights serve this purpose. Both double a sign’s exposure by making it visible at night as well as during the day. However, traditional real estate lights require the use of electricity, which adds to utility bills, and long, expensive electrical wiring. Solar powered real estate lights, on the other hand, operate using only the energy of the sun, which cost nothing and a are self-contained units with no external, long electrical wire runs. Therefore, operating solar powered real estate lights cost nothing. Talk about economical. Think of all the savings! And better yet, the use of solar energy does not emit harmful C02 and does not deplete natural resources, so solar products are very environmentally friendly. Interested in learning more? Check out our Solar Real Estate Lights here.